Come out and enjoy a nice warm weather day with carts off paths for at least a day. Nice warm breeze today help to dry things out. Started mowing fairways late this evening before dark. Mowers will be out in force trying to get the course trimmed up before the next round of rain enters the picture sadly for the rest of the week. Let's hope the forecast is wrong! We will also be opening the long range grass tee for the day. Turf still needs to grow some but good enough to hit off of for one day or two days. Better come out the next couple of days. Great weather in store. Not sure if we get off the paths until Wednesday but great weather. The 2nd seedhead reduction application is being applied today. Control has been okay this season, better on some greens and not as well on others. 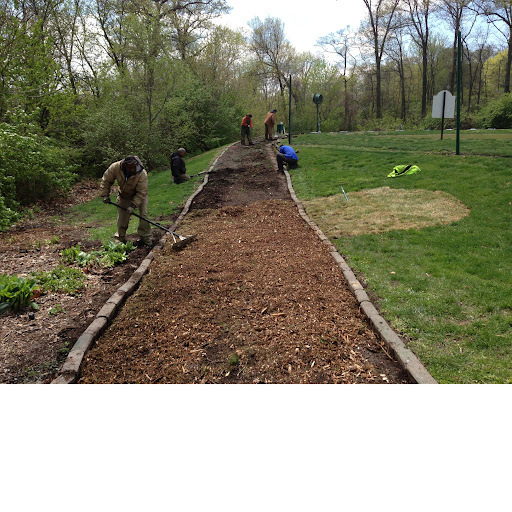 This season, we are using a dyed brown mulch from St. Louis Composting on all of our ornamental beds on the property. Becky Edwards, our horticulturist began the pain staking shoveling yesterday and a couple of other staff members assisted her today in front of the clubhouse. We will be spreading about 80 yards of mulch hopefully only once this season. The mulch is important to help retain moisture and keep the root systems insulated from extremes in temperatures. Becky hates her picture being taken but oh well! One scoop at a time is a lot of spreading. The finished bed in the background. The intensity of the green lawn and brown mulch make the plantings stand out and our beautiful clubhouse. I expect to open the long range tee about the middle of next week. With some warmer weather predicted next week, there should be enough turf to begin hitting off of this tee. You might want to do more of your short game work on the short range since its turf is more full for a couple of weeks to allow the bermuda to fill in. I know many are wanting to hit drivers off of the grass which would be perfect for this tee initially. I would just ask that you do not chunk out big squares of turf until things begin to really move. Thanks for your patience. This is the type of divot damage that we would not want to see through out the season but especially in the early season. Large bald areas take about twice as long for the turf to fill in as narrower styled divots. We will use sand with ryegrass in an effort to help the area become covered during the early season. During the main heat of July and August, we place only sand in the divots since it is usually too hot to get ryegrass to germinate and survive the heat and our zoysia/bermuda grass is growing at its best. Longer, thinner divots are better so that the turf has a much easier time to bridge across the thinner divot. Short range grass tee open! The short range grass tee is open for play today. It has greened up enough and has dried from the recent rain. This tee has a sand capped layer which does allow it to drain more quickly and be ready for play sooner than the long range. It also gets full sun which helps it dry quicker as well. It as not growing very much but with the rain reducing our playing schedule every few days it should be good enough for the amount of wear that will take place during this opening phase. The long range tee is a little behind this season because the Patriot bermuda has slowed considerably from the cool, wet weather. I sprayed RoundUp and premergent on the tee in February to reduce the amount of poa annua competition we got on the tee. I will overseed 1/2 the tee this fall so that we will have green turf to hit from on the long range tee during the early part of the next season when it is dry. This season, we have decided to leave both grass tees open Tuesday-Sunday with no restrictions to the mats except when it is wet. Remember, the tee closes early on Thursdays so the staff can pick the balls for the next mornings rough mowing. The range rough are mowed on Tuesday and Friday mornings before play arrives. They will be picked clean on Mondays during tournament time and will be closed slightly early on Sundays when there is no Monday outing. Please keep in mind that shots hit more than 140 yards will more than likely end up off property. I would limit shots to 125 yards just in case you might hit it further to insure that our range balls remain our range balls. Thanks for your cooperation. First grass tee action ready on the short range. She's doing okay. As many of you know, my sidekick Lady has been slowing down a bit over the last couple of years. Especially this past year where many a day she ends up in the backyard sleeping outside from morning and into the night if I would let her. Rolling from side to side and sunbathing on a crisp 40 degree day sleeping and dreaming of the many days of fun she has had on the three golf courses I've managed during her time. A bit of sadness has crept into my subconscious for the fact that she is not with me everyday. 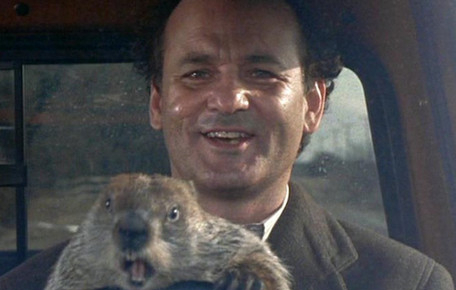 Inevitably as we all face with our pets, the time is coming. I hope not right now but it is coming. She's slowed in part from her age which is hovering between 13-14 and too many hand fed meals from me guilty as charged. Last fall/early winter, I noticed her hearing was not as good. Some say selective which is true of all of us but in her case it was becoming real. If I was not in front of her and she would have difficulty locating where I was. She would look out in front of her and I was coming up from behind. She also experienced her first yeast infection in the ears and the material that I treated her with to my dismay could and did create deafness. No warning from the vet, pretty upsetting that I pushed along this condition but did not think I would be given something harmful to my animal and not be warned of potential problem. Well, the long of this story is she still likes to come to work every few days, still likes to roam to the pro shop and up and around the kitchen if I don't watch her close enough. The day that I think she can barely get up I have to go up to Wallingford and pick her up walking along the side of the road. She seems to be hearing loud noises pretty well but cannot hear you talking to her unless you are face to face. I don't think she hears your voice, I think she look in your eyes and knows that you care. She still loves attention and knows a few golf bags have treats stored for her. Memory like an elephant! I ran across this picture on my home computer that I had not seen for a while that I thought I might share. This was one Saturday or Sunday evening at Spencer T. going out for a little drive. As you can see by her physique, she is in studette shape. During her best days, she was easily a 10 mile runner, walker and hunting fool at about 55 pounds. Her first morning duties would be to run the 6.5 miles it took to mow greens in the first 2 1/2 hour of the morning. Sometimes she would get sidetracked by a squirrel, raccoon groundhog, muskrat, deer, turkey, and goose. Ok, you get the picture, she loved to hunt animals. I know this is a little sappy for some but for those of you with animals you understand what I am expressing. She has spent more time with me over the last 13 years, morning, noon and night. Patiently waiting in my office while I'm at a meeting. Getting up at 4 a.m. and coming home at 9 p.m. with not even a whimper or complaint. Sometimes just a big sigh that she is tuckered out. trusted friend and protector of the properties I've managed. Even though our temperatures indicate we are far from summer, we just mowed most of them @.625" which is our regular season mowing height. There are still 3-4 which did not get completed before the rain yesterday but I would expect to get them completed by Friday. Overall, the fairways are coming along well considering the cool wet temperatures. The Bermuda took a hit with Saturdays low near 30 but should continue to green up with some warmer weather. The long range walk is being repaired for the season from moles who make their runs through the mulch enriched soil and erosion from heavy rains. The moles come in and out of the wood line making them difficult to trap before they've done their handy work along the path. The staff are straightening the paver border and doing a light refreshing with mulch that was ground from dead trees that were removed from the property this past year. 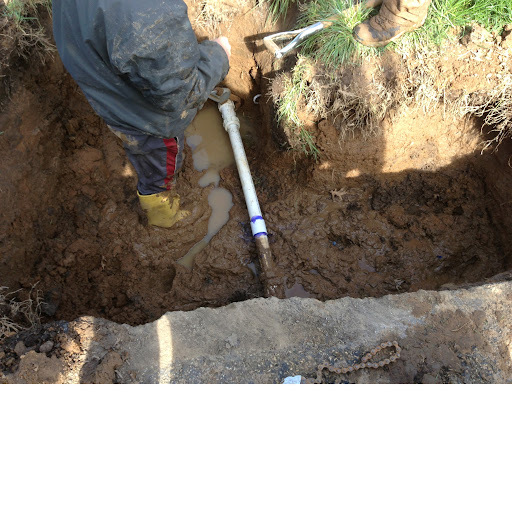 The staff was able to get the water line repaired in front of 16 tee today. 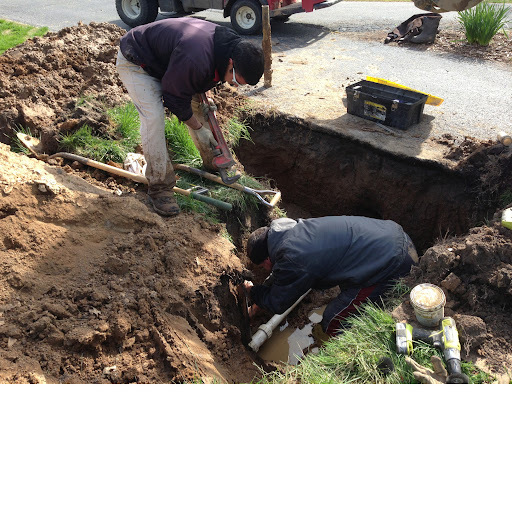 The original water line that fed the club came from Lucas & Hunt Rd. That water line still feeds the pro shop and maintenance building. I would guess it is at least 80 years old which is why we repaid leaks in this line at least once or twice each season. The new repair. We made the initial repair and then discovered another leak a few feet away. The staff are walk mowing greens for the first time this season. You should notice the cut to begin to tighten and become a little more consistent. You will also notice the striped 20" lines going the four different directions that we mow. We designate a different direction each day to help reduce grain which can occur from grass blades laying over. Of course brushing and other cultural practices assist with this effort as well. We mow straight(front to back) Mon/Fri, left front corner to right rear corner 10-2 Tues/Sat, right front to left rear corner 4-10 Wed/Sun and across from 3-9 on Thurs. We do a circle pass or clean up around the green two passes next to the collar every other day. We alternate the days to reduce wear on the circle which is already being rolled upon every day when we cut the green and then make our turn off the green and come back the opposite direction. 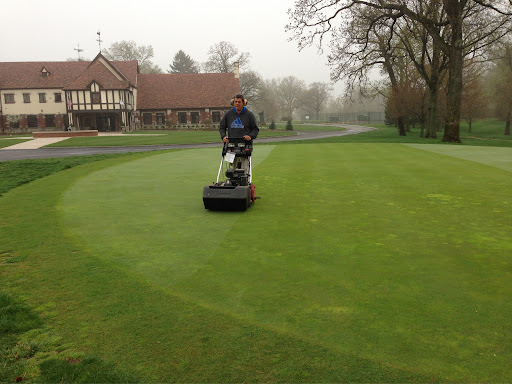 We usually designate 3 mowers every day for this work that can take up to 2.5 hours or so to complete. A little faster for some operators and a little slower for others. On some days, we add a fourth mower which reduces the time to about 2 hours or so. Usually within the first 45-60 minutes, the PG, 1-5 are completed which allows the course to be ready quickly for member play. We are usually out at least 1.5 hours before member tee times to insure the course is ready at the designated starting time. As most of us know, that rascal ground hog did not live up to his end of the bargain for March. We had only 10 days in March that met the average temperatures or better. Here is March weather by the numbers. Avg Low 32.0 36.6 -4.6 " "
Avg 40.0 46.3 -5.8 " "
Hasekamp twin's home was hit last night by the tornado in Hazelwood/Florissant. Jeff and Joe work on our seasonal crew. Uprooted a large tree and lifted it on the house and into their parent's bedroom via through the roof. Everyone was heading downstairs when the storm hit and is okay. Course had no issues that we can see in our initial assessment. Just a few small twigs and limbs down. Staff will be blowing junk off greens, tees, and out of bunkers with just some minor hand pushing of sand along the edges. 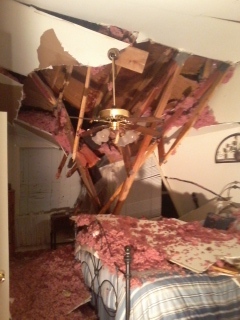 Hasekamp home with large tree lifted into the bedroom. A slight bit of washing off the face of the left bunker on #4. Fairly easy to repair compared to bunkers full of water and bunkers being almost unplayable for 3-4 days. 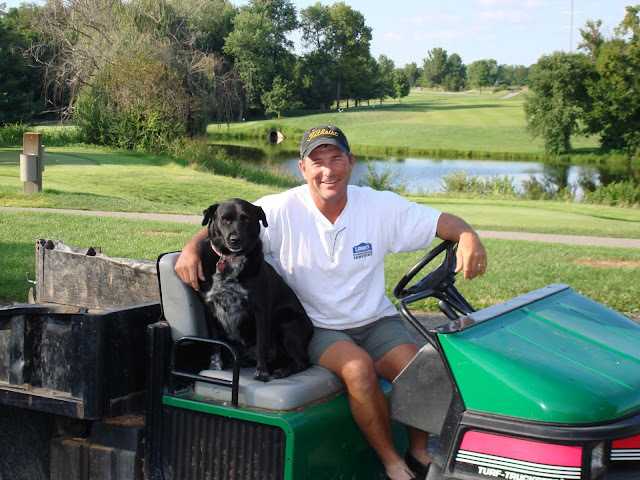 With the warm days and especially warm nights, we plan to allow carts on fairways beginning with the Ladies Opening Day on Tuesday, April 16 as long as conditions are dry. 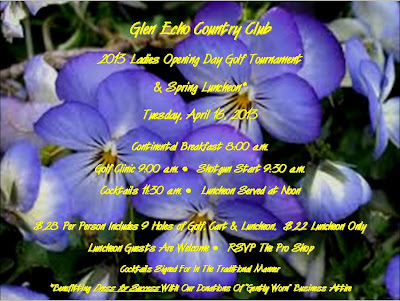 So for those of you who weren't going to play because of cart path only, this restriction should be lifted as long as the rain stays away 70's are in the forecast for early next week so join the ladies already signed up for golf and the luncheon afterward. If you don't play golf, Chef Terry will have a great dinner planned. 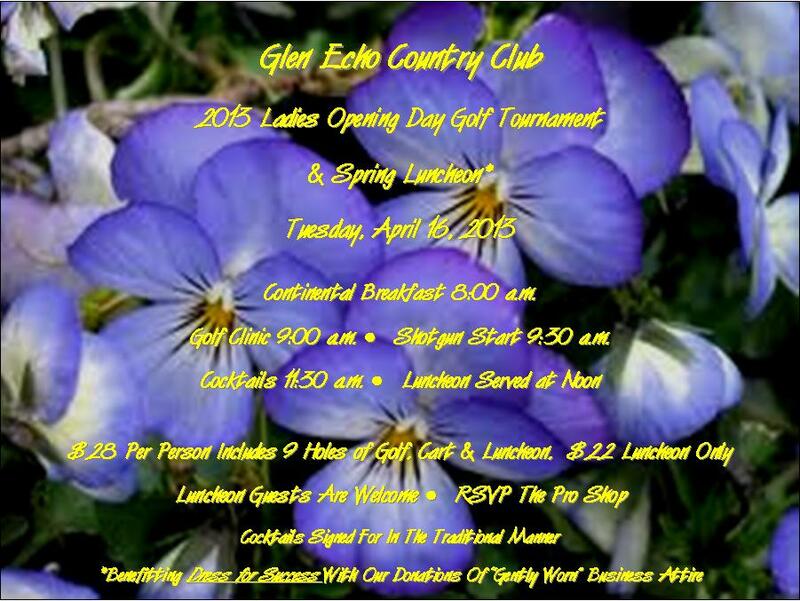 Guests are welcome at the luncheon. The staff have spent parts of the last two days repairing the tree stumps that were ground earlier in the spring. There were also ruts created by our rough mower as it would go around trees. Some of these spots had soil in them since late last falls bunker project when we had some extra soil. The areas were leveled and edged with the sod cutter and then sod was laid over the top. There are still a number of areas that we need to repair. Nice warm days and warm nights is beginning to green up the zoysia slightly on the course. I don't set a specific date for allowing carts on the course but I would always try to allow carts off paths around opening days but we do have some colder weather predicted for later in the week which could slow down the push to green. Updated look of #1 fairway on Wednesday 4/10. Mr Pierson, ready for duty sir! Mr. Pierson, calling you and other cherished members who have gone before us to watch over the membership, staff and facilities for another season of great times at Glen Echo. A gathering spot for many, The Pierson Memorial Plaza has come to life again with the fountain feature flowing water over its five falls. The staff installed the pump and other plumbing today. Standing room only in the greenhouse!! Joe WachterStanding room only in the greenhouse this season. Plants lining the floor as well. Plant sale scheduled for May 11th. Becky says she will have some nice product for you to purchase! Have you made your crabgrass pre-emergent application yet this season? Its getting close to the time to get this product applied. Our zoysia application was made in February in combination with RoundUp to kill the poa annua that had germinated. If you've played the course in the last month, you can see the dead spots of poa annua. Don't worry, there is zoysia under most of those spots that will fill in once the warm weather arrives for good. There are a few small spots that we missed which you can see but overall we had a good application and kill this season. This past week we have been applying our crabgrass pre-emergent in the rough. We use the chemical name Prodamine which is commonly known as Barricade or other generic brands. There is also a product called Dithiopyr(Dimension) that is a good product as well. This season, we are applying a granulated formulation on a 0-0-7 potassium fertilizer product at about 185 #'s an acre. We will be applying about 8,000#'s of material to our roughs, around our tees and on the cool season tees which is only about 5 tee surfaces. The growing degree models are showing we are still on the low side of the range but we are getting closer each day and wanted to get most of this application down so we can get some rain on it which will release the chemical to the soil surface and will bind with the soil. The pre-emergent disrupts cell division when it is trying to germinate which leads to its death. Our grass is happy with this death because it has less competition and I'm happy because we have a purer stand of grass. Spreader that we use on the large rough area. It will hold comfortably about 700#'s of product. We use walk spreaders on the tight areas around greens, bunkers, tees etc. This spreader will throw about 20' feet on either side of the application, more or less. Each year we attempt to reduce the amount of seed heads that are produced by the poa annua that contaminates our greens. We use a Base 32 growing degree model to determine when to apply this application. The application is a combination of 2 growth regulators working in combination to reduce the amount of seed heads which can create ball roll issues. Heavily infested greens will have more overall seed heads than lower % greens which makes it appear that the product does not work but it does work. Researchers state that you can expect on average a 50% reduction in seed heads. If seed heads do occur, one thing the products do is shorten the length of the seed head stem helping to keep it closer in the canopy and not disrupting ball roll as much. We started to accumulate data this year around the end of February. The model involves averaging the high and low temperature of the day and subtracting that number from 32, the base number and then accumulating the degree days until they add up to the target range. See the example below. Each day, the growing degree days accumulate. This season, we did have some days when the average temperature was below 32 but you do not subtract a negative number from the total. The model we use calls for application around 300 growing degree days. Right now we are at 367 growing degree days which is a little higher in than zone than I like to be but I think we will be okay. We will make a second application in 21 days. Last season, our application was made on March 5th and we hit our current total of growing degree days on March 10, 2012. What a change from one year to the next. The average for us is usually about the 3rd week or so of March. Michigan State has a site that we utilize http://www.gddtracker.net if you have interest in exploring this subject further. 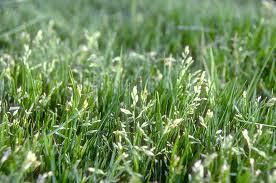 There are models for crabgrass, poa annua, and broad leaf weeds. What are the logs doing at the field bar? Joe WachterBecky decided to turn 3 old oak logs into planters behind the Field Bar this season. Should provide for some nice seasonal color to that area! Our spring deep-tined greens aeration was completed on Tuesday afternoon. I've attached a few video clips of the work and will discuss in greater detail why we must do this work. Almost all modern courses are built with a 12" sand base with a 4" pea gravel and pipe drainage system which helps to drain excess water from the profile. Below is an example of this construction. #9 green is built with this construction except the thin tan area(choker layer between the gray(gravel) and brown(sand) is left out. The rest of our greens have just 4" of sand and then soil from their original construction 100 years ago at its base. There is probably a cinder layer and some clay tile that were placed in old style greens but they are all but useless to us now. 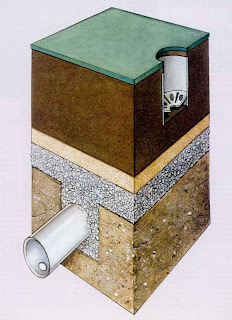 Water penetration. We want the water to move from the green surfaces into the root zone. Dryer surfaces usually means improved play-ability and turf health. Smaller ball marks and reduced wear and tear from foot traffic which can effect ball roll. Gas exchange. Oxygen enters the root zone and excess carbon dioxide which is harmful to roots and microbes exits. Improves rooting. The long channels of sand that go down into the soil layer of our greens improves rooting depth, overall health, and drains water through the profile. Topdressing of the greens helps to smooth the surface and reduces thatch. Below are a three videos from our work on Monday-Tuesday. I included the actually aeration of Green #11, blowing sand in the holes of #13, and brushing the greens with #10. I did not have video of the topdressing of the greens and rolling of the greens after the process to smooth them out. I would expect the greens to be in good shape by Masters weekend. The staff are completing the first main clean up around the bunkers today. Mowing, weed eating, trimming, sodding exit trenches etc from last Fall's renovation. We were able to get holes 1,3,4,5 and 18 completed today with some major clean up, trench clean up, head leveling and sodding, and mowing around the bunkers. We will finish the mowing, trimming and raking of the bunkers on Friday and will begin to trim some of the sod edges and finish clean up repairs early next week when we have more time. The staff completed the practice green and 1-15 today. I delayed the fertilizer application because we are charging our irrigation system and it was fairly windy today. The irrigation system should be near operational tomorrow. Once that is complete, we can water in the fertilizer and this will also help to knock down he sand into the canopy. We did not get #11 top dressed with sand because it was a little wet. With the holes opened, it should dry enough so we can complete it on Tuesday. We still have 16-18 left to aerate. We will probably get at least 2 of the 3 completed on Tuesday and the last one finished on Wednesday. Made an earlier post about our gumball clean up but have a major effort going on in the next couple of days. Our seasonal help started today and are cleaning up additional Sweet Gum balls that have dropped all over the course. A lot of raking and hauling the piles of these devious little balls to the waste site..
Staff cleaning up the Sweet Gum balls from the right of #2. Aeration going 8" deep with our verti-drain 7316. Topdressing the green with sand providing enough material to fill the holes. Brushing and blowing in the sand. Applying a green amendment product and fertilizing. I will post more detail regarding our work over the next few days. I expect it will take us until Wednesday to complete the process. We will finish as many greens today as possible until dark and will then do a couple of greens a day to finish the process so we do not interfere with play. With filling the holes with sand, I would expect the surface to be back to normal in the next 10 days or so. During the next few days, we will only be able to mow greens when they are dry late in the morning to help keep the sand from being pulled up from the rollers on the mowers. This will keep the sand down in the canopy of turf and will help with improving ball roll.